Eric Prydz promised he’d “blow your heads off” with the unveiling of his EPIC 5.0 show in Victoria Park, London. After months of waiting with only a couple tantalizing teasers of what was to come, the Swedish icon certainly did what he said he was going to do in spades. 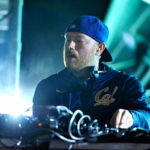 Luckily for his fan base, one particularly diligent concert-goer by the name of Fred Klem seems to have caught the entirety of Prydz’ set on film, and by the looks of it, it was a veritable night for the books. Crisp, extremely high-definition visuals lit up the geometric backdrop, whose design takes on similar traits to EPIC 4.0’s setup, while plenty of artfully-arranged lasers blanketed the crowd. At times, the visuals seemed three-dimensional in nature. Prydz of course made sure to provide guests with music as incredible as its accoutrements, drizzling his extended set with plenty of old and gems from his favored aliases as well as a slew of yet-to-be-released favorites, taking his audience on an entrancing journey through the upper echelons of progressive and dark, throbbing techno.